This is a 5 stop organ, with a single manual with pedal pulldowns. It is for the performance of 17th century music. 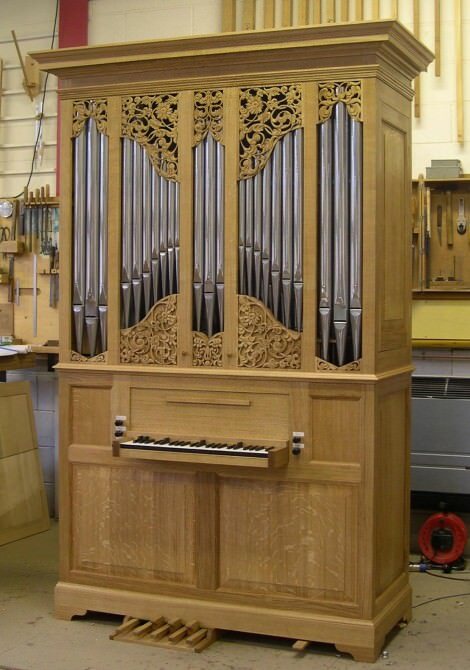 The sound and some of the mechanical details are based on the organs at Wollaton Hall near Nottingham (ca1690), and at St Lawrence Whitchurch, Little Stanmore in Middlesex (1716). These organs were probably made by Gerard Smith, and represent a tradition of building small organs which stretches back through the 17th century in England. There is a shifting movement reducing to the Stopped Diapason. C D E F – d³ 49 notes. There is a short, broken bass octave, with the E key playing C, F# playing D at the front and F# at the back, and G# playing E at the front and G# at the back. There are split keys for the enharmonic notes eb/d#, eb¹/d#¹, eb²/d#². There are toe pedals for C D E F G A Bb B (short octave arrangement, 8 notes). The pitch is A415Hz. The tuning is quarter comma meantone. The natural keys are covered with cow bone and the sharps are covered with ebony. There is a pair of traditional wedge bellows, four-fold, with feeders, pumped either by hand or by electric blower.